Kosovo, the 90's, part of the population moves to the montains and dreams with a better life “anywhere else”. This is a film about boundaries, about refugees, about Europe, about what we were and about what we are. 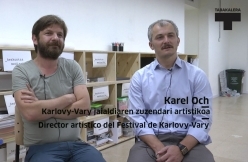 Karel Och, artistic director of the film festival in Karlovy Vary (Czech Republic), presents the festival and selects the film to be projected, Babai by Visar Morina, who will be also present in the screening. In fact, Babai was awarded with Best Director and Best European Film at Karlovy Vary. *Tabakalera would like to express thankfulness to SEFF-Festival de Cine Europeo de Sevilla.